Master Sha gives you the knowledge, wisdom and sacred practices to uplift your soul standing, which is the key to reaching soul enlightenment. This priceless jewel of teaching and sacred practice offers you a direct experience of Master Sha's divine wisdom and incomparable teaching style. It is also an excellent preparation for attending a Soul Healing and Enlightenment Retreat with Master Sha. It is possible to reach soul enlightenment in this lifetime and fulfill your soul's journey. 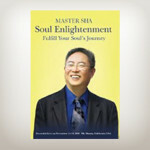 In this priceless recording, Master Sha gives you the knowledge, wisdom and sacred practices to uplift your soul standing, which is the key to reaching soul enlightenment. This priceless jewel of teaching and sacred practice offers you a direct experience of Master Sha's divine wisdom and incomparable teaching style. It is also an excellent preparation for attending a Soul Healing and Enlightenment Retreat with Master Sha.